Last Sunday, I ran my fifth marathon. I am ashamed to admit that I did not run a smart race and that, as a consequence, I was disappointed with the result. I basically did not sleep at all Saturday night. I kept tossing and turning. I set my alarm for 4:20am but, comes 3:00am, I couldn’t stand staying awake in bed any longer and I started getting ready. I grabbed the 1 train to South Ferry at 4:50am. On the train, I sipped on some water and ate a toasted bagel with honey. I met some Whippets along the way and that made the subway ride fly by. We ended up catching the 5:50am ferry. While on the ferry, I finished my water. We made it to the athlete village with lots of time to spare. Courtney, Alex and I waited for the corrals to open for approximately two hours. The weather was chilly (yay!) and the sun was shining! I took advantage of this time to finish my breakfast: 20 oz of Gatorade Endurance Formula, a banana, a chocolate PowerBar and pure black coffee from La Colombe. After using the bathroom for the umpteenth time, it was time to head to the corral. I was feeling extremely nervous, but it was not the usual pre-race nervousness, the one that is accompanied with excitement and adrenaline: I had the feeling that something wasn’t right. I tried to think positive, to believe that it was going to be OK but, truth is, I started the race already defeated. I ate my gel, hugged Courtney for the last time, started my Garmin and, before I knew it, I was on my way to Brooklyn. 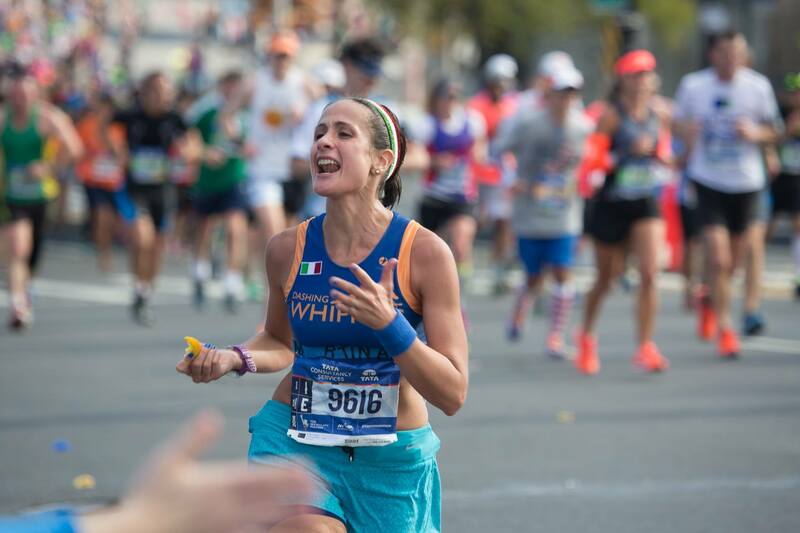 I ran New York three times and this was my first time on top of the Verrazano bridge: I thought I would feel so excited, but I hated every second of it. I was in shorts and a cropped top, but I was already feeling so hot. The views were breathtaking, but all I could think about was the fact that my legs weren’t feeling as fresh as they usually feel at the beginning of a marathon. I followed my plan to a T: go SLOW on the uphill, let it go on downhill without killing yourself, and then enter a comfortable rhythm. Doing so, I hit the 5K mark in 23:32 (7:34 min/mile): right on pace. Fourth Avenue is always a huge party! So many kids who want to high-five you! Was I invited to the party? Yes, but it seemed like I forgot my invitation at home. I could not find the energy to high-five one single kid. I kept looking straight in front of me while trying to maintain a rhythm that did not feel as comfortable as it should. 10K split: 47:15 (7:36 min/mile). After the 10K mark, I forced myself to eat my first gel. We turned on Lafayette Avenue and woah! It was SO crowded. This section was uphill and I was weaving left and right because people were slowing down considerably or stopping altogether to grab water. I had no choice but to slow down myself. I was ok with it though: whatever goes up comes down, and I could make up for it on the downhill. 15K split: 1:11:02 (7:37 min/mile). The halfway mark was approaching and I knew that I didn’t have it in me to keep the rhythm I had been keeping until then. I kept trying but, once I started climbing the Pulaski Bridge, I gave up: my legs were feeling relatively ok, but my heart rate was too high for being only 13.1 miles in. I had no choice but to [finally] listen to my body. I crossed the halfway mark in 1:40:26 (7:39 min/mile). For some reasons, I never liked Long Island City: too many turns and you know the Queensboro Bridge is coming… not the greatest combo! I took my second gel hoping to get some much-needed energy. I saw Moses and, by the look on this face, I knew that I must have been looking terrible. He kindly offered me a bottle of Gatorade, but I passed. All I wanted to do was crossing that damned bridge and finally enter Manhattan. On the bridge, my Garmin went nuts. I knew I was slowing down step after step and, before I realized it, the 3:30 pacer passed me… and I didn’t even care about it. 25K split: 2:00:10 (7:44 min/mile). I got on First Avenue and all I wanted to do was stopping. I knew my fiance would be at mile 17 and I kind of did not want to see him: if I’ll saw him, I’ll stop. Sure enough, I saw him and I stopped. I started crying hysterically. I told him that I was sick and that I did not want to finish. He knows me way too well and so he asked me if I was really sick or I was just freaking out because I started falling apart. Meanwhile, the whole First Avenue started yelling: “You can do it! Don’t give up!” Calling it a day was so tempting, but I am not a quitter: I had to make it to my beloved Central Park. This feeling lasted until 110th Street, when I saw Celia and Kaitlyn cheering at the corner of the street. I stopped again and I started crying again (did I ever stop crying since mile 17?). Kaitlyn tells me that, if I really do want to stop, I can do so and give it another try in two weeks in Philly. I thought about it for a few seconds, but I knew what the right thing to do was: finishing THIS marathon, even if that meant not getting the time I trained so hard for. But I felt I couldn’t do it alone and that was when Celia jumped on the course and started running with me, professional camera around her neck and all. She only ran with me for a few blocks, but that was all that I needed: I calmed down, started going at a steady pace again (albeit it was over 30 seconds per mile slower than the pace I had kept until then) and, most importantly, I changed my whole perspective. I had 6.2 miles left at that point. 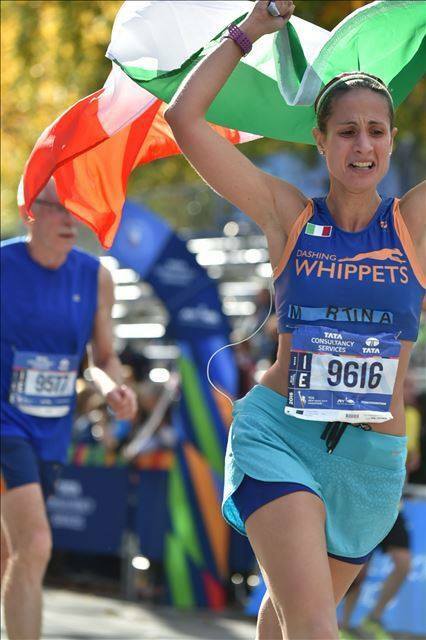 I was not going to run a PR, but I could still have the time of my life in the city I fell in love with ten years ago and I moved all the way from Italy for. So I put a huge smile on my face and got the party started! I started high-fiving as many people as possible, thanking spectators left and right, grabbing slices of orange and even glasses of coke along the way because what did I have to lose at that point? Then, when I saw the Whippets’ cheering station, I just lost it (as you can clearly see from the pictures). Stopping twice cost me quite some time, and I hit the 35K mark in 2:53:40 (7:59 min/mile). I took my final gel at mile 22. My stomach was a mess, but I knew I had no other choice. Then Fifth Avenue came and again, I had two choices: whining about my quads hurting like hell while going uphill or smiling even harder because Central Park, my favorite place in the whole world, was finally approaching. I chose the latter and, for the first time in my life, I had a blast while climbing Fifth Avenue! I spent that entire mile joking around with the spectators and I was so happy to see so many people I knew or was familiar with. I saw Team Fox and thought about Jennie Kelly and the outstanding work her family does for this important charity. I saw Christine and Carolina, who recently killed the Berlin Marathon and provided me with so much inspiration. I saw Tiffany and thought that, exactly three years ago, we were both attempting to break four hours during our first marathon and now I was still on pace for my third BQ while Tiffany just destroyed the Hartford Marathon (made a mental note to ask Tiffany what training plan she followed to achieve that eheh). I saw Kaitlin, who stuck with me during those awful summer runs. I entered the park and my fiance was waiting for me with the Italian flag. I grabbed that flag with pride and we both made our way to the finish line while a lot spectators started yelling: “Go Mexico!” Lol. I saw coach Chris at the mile 25 mark and my smile disappeared for a second: I knew I ran a stupid race and was feeling embarrassed. That didn’t last too long though because, once I got to Central Park South, I heard the loudest “Martina!” I have ever heard in my life: it was Caitlin and Megan Jones’ parents (well, mostly their mom ;)). That gave me the last boost of energy that I needed: I started dashing towards Tavern of the Green, raised my flag and crossed that finish line in 3:31:49, over eight minutes slower than my PR from Boston and over ten minutes slower than the time I had trained for. Sunday was the first time I did not PR in a marathon. I know you cannot PR at every race and I am more than ok with that… unless that race is a marathon. I run two marathons per year (when I do not get injured) and I train for them with so much passion that yes, I do expect to run a PR every time, even by just a few seconds. But, truth is, you cannot always win. To be honest, all the signs were there: my training had been a struggle thanks to the heat. I tried as hard as I could, but I could barely run the same paces I was running before Boston last April. I fainted during Team Champs in July. I ran Staten Island over four minutes slower than my half marathon PR from the NYC Half. On Sunday, I did not feel confident, yet I still tried to go for it. I thought I was not looking for much: “just” a 3 minute-PR. Well, you know what? Numbers are just that: numbers. Had I listened to my body from the very beginning I would have still missed a PR, but I would have enjoyed the experience much more and I would have run a smart race. That is what upsets me: the fact that I wasn’t smart and the fact that I fell apart emotionally. Would I change anything about Sunday? NO! I needed a marathon like this one. I needed to learn those lessons. Remember: you cannot always win, but you can still make the most out of every situation. I wish I could tell you that I hate marathons now, that I feel so defeated after Sunday. However, I do not. I love marathons even more now and I feel more motivated than ever. It was hard for me to write this recap. It is not easy to admit failure and to show your vulnerability. However, I am like that: I love running and I love sharing the bad and the good about it. I hope people will be able to learn from my mistakes. Thank you for reading and, especially, thank you all for your immense support.